Oster Pro 1200 Blender Review - Eat. Move. Hack. Surely anyone who’s spent considerable time working in a home kitchen understand the importance of a have a blender. At a mid-range price point, the Oster Pro 1200 is made to fill the need. While it might not be the top pick of executive chefs and health gurus, a lot of its aspects are comparable to commercial-grade blenders, which is quite impressive for a small appliance at this price. You can get this blender for far less than what many passionate home chefs pay for this kind of equipment. Of course, being a budget-friendly unit, there are a few drawbacks. Some of them are only a disadvantage depending on the need of the user. In fact, there are pricier blenders that get far more customer complaints than the Oster Pro 1200 – some of them are even commercial-grade. It follows that most users find this blender more than adequate for their purposes. A blender’s blade is one of the main features that set it apart. It doesn’t really matter how many speeds one has or what it’s capacity is if it can’t handle the foods you plan to put in it. The Oster Pro 1200 has the power to grind through ice cubes and frozen fruit without added liquid. It can even grind up chia seeds. This is thanks much to its Dual Direction Blade Technology. It gives the 1200 superior blending power. The blade system is a generous 3.5” and its design gets the ingredients down to the blade faster, producing a smoother outcome. One of the key things that attracts a lot of consumers to this blender is its larger capacity. This is an extra large capacity blender that can hold and process up to 8 cups of ingredients in its jar and up to 5 cups in its food processing bowl. That extra room is a big deal if you have a big family or plan to use this blender for whipping up treats for your party guests. The Oster Pro 1200 comes complete with Smart Settings Technology. Users get to enjoy 7 different speed options to make their creations come out just right. There are even 3 pre-programmed settings that make it easier for you to find the right one for some of the most common blender recipes. In addition, the 1200 has a special pulse feature that gives you an added measure of control and greater precision. 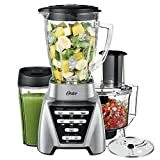 Clearly Oster is proud of the power they’ve boosted this blender with, as the Oster 1200 has 1200 power watts – its name reflects its power. That amount is much more than you would expect the average blender to have. But take that number as surface deep, because there’s actually more to it. This blender has 900 watts of power that’s specifically for crushing ice. The power specifications are listed as 120 volt 50/60Hz 7.5A max. This, when combined with its dual blade system gives users to blend up just about anything. With this model you get both a jar and a food processor bowl. Both are made of a sturdy glass, which is a highly desirable feature for blenders. Only the included personal blending cup is made of plastic. The glass is Oster’s signature Boroclass glass, meaning it’s shatterproof, which is a big pro if you have children or are prone to dropping things. You won’t have to worry about your blender cracking under pressure as its powerful motor and blades churn on. There are a lot of things to be excited about on the Oster 1200. It has impressive power that can outperform even the high quality blenders found in a certain remarkably popular major coffee shop chain. The extended capacity of the jar and bowl can help you save time when whipping up multiple servings. And with the shatterproof glass and 10-year warranty on metal parts, you can be sure this blender is made to last. Whether making frozen fruit smoothies, crushing ice, or even making their own peanut butter, users are impressed with the power of this unit. They happily note on how sturdy and solidly-built it is. In some cases, it has inspired users to blend more often. But of course there just has to be a disadvantage or two to deal with. There aren’t many cons of the Oster 1200, but some users find it doesn’t do very well with dried fruits in particular. And, while the glass jar and processing bowl are very durable, the plastic smoothie cup is prone to cracking. Plus, users are having a hard time finding replacement gaskets for this blender. The part seems to have been discontinued. The Oster Pro 1200 Blender is an impressive value for its price. It outperforms many of the more expensive blenders, even those that are commercial-grade. And this is a blender that tends to last long, staying sturdy and powerful even with heavy use. There is a bit of room for improvement, as the smoothie cup that comes with it simply isn’t up to par. Those who want to make smoothies with this blender would be better off using the glass jar and then transferring their creation to a serving cup. All in all, there’s a great chance you’ll be pleased with this Oster blender. It can handle chopping, grinding, and liquefying some of the most stubborn ingredients, though not dried fruit. Even users who make a living making blended drinks find this blender to be amazing in comparison to the equipment they use while on the job. Truly, there’s little more to ask for in a blender for a home kitchen. Bodybuilders and health enthusiasts will find it gives them smooth, consistent results on their protein shakes and other specialty supplements, getting out all the little lumps without leaving grittiness. Indeed, with the Oster 1200 around, there’s no reason to shell out more for a pricier unit unless there’s some fancy extra that you just can’t do without. There’s a good chance that this blender can satisfy all your at-home blending needs.